What makes a great children’s book? Based on the number of picture books released every year, it seems just about everybody thinks they know the right formula. But, no, it’s not all that easy to create a beautifully illustrated, well written book for youngsters—we see a couple thousand a year here in Foreword’s offices and the uninspiring books far, far outnumber the very good ones. 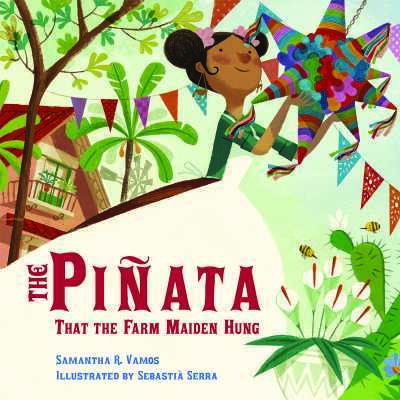 Today’s interview is between our longtime children’s book reviewer, Pallas McCorquodale, and Samantha Vamos, author of The Piñata that the Farm Maiden Hung, a splendid new project from Charlesbridge. Pallas bestowed a rare star rating on the book in her review for the January/February issue of Foreword Reviews, so we knew the book was special and worthy of this Face Off interview. All good. But what we weren’t expecting happened when Pallas got back to us with the Q&A. We were floored by something she said offhandedly to Samantha because it so perfectly articulates the qualities of a great book for children. How’s that for kind words? As in the past, Pallas brought in some of her students (she’s a child/youth services librarian in Florida) to help with the Q&A. Enjoy! Although I am neither a native Spanish speaker, nor do I speak Spanish at home, I have always been interested in Latin American traditions and culture. As for language, one of my dearest friends is Cuban and I regularly consult her when uncertain about words. Although I did not have to look up the words that I used in this story, I do often look up words. When I was young and when I spent time with my father’s extended family, I heard a mixture of languages. My father speaks seven languages (five of them fluently). 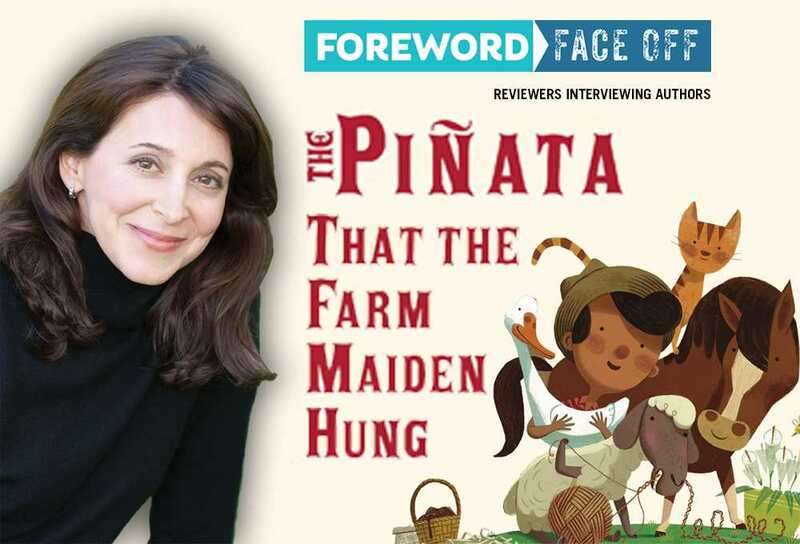 I wrote The Piñata that the Farm Maiden Hung and its companion picture book, The Cazuela that the Farm Maiden Stirred in the manner in which my father speaks (especially with his siblings)—mostly English sentences with words from other languages sprinkled in. I believe that the song originated in Mexico. It is tradition that while a blindfolded person tries to hit and break open the piñata, the crowd of people watching clap and sing the song. A person’s turn lasts as long as it takes the crowd to sing the song (unless the person succeeds in breaking the piñata before the crowd finishes singing!). When I was about ten years old, I made a piñata in the form of a dragon. I enjoyed this type of art project because it involves different stages and creating something three dimensional. I liked gathering recycled materials like egg cartons, paper towel rolls, and plastic bottle caps, for example, and incorporating them to add shape and detail to the piñata. My favorite part of making a piñata is the decoration—I like painting the piñata and gluing on colorful crepe or tissue paper fringe. I loved arts and crafts projects when I was young, and as an adult, I still enjoy them although now I tend to only work on projects like that for Halloween. I enjoy creating costumes with and for our son. I’m so happy you like the animal characters. I chose animals—instead of people—to create parts of the piñata because I find animals to be universally relatable. There is also a general fondness towards animals and the idea of an animal performing human tasks is both interesting and, at times, amusing. As I imagined the cat (gato) using its sharp claws to furiously shred the paper (papel) into strips, I laughed. As the writer, I am typically not consulted in advance by the illustrator with respect to how characters will appear so it was a complete surprise to me when I first saw the animal characters Sebastià Serra created. I absolutely love them. Folk art and traditions appear throughout the story, and artist Pedro Linares López is even given a shout out as the creator of alebrijes. Were there any other individuals or cultural movements that inspired you? Can you recommend any artists or resources for children—or readers of any age who would like to learn more about Mexican or Oaxacan-Mexican folk art? After reviewing many different ideas, I decided that the farm maiden and her farm family would create a piñata. Once I knew that a piñata would be central to the story, I began doing some research and I came across two contemporary artists whose piñata-inspired work really appealed to me. Artist Justin Favela creates large-scale piñata-style sculptures and “piñata-murals” with papier-mâché, or layers of multi-colored fringed piñata paper. Favela’s work is sometimes inspired by pop culture. Artist Roberto Benavidez creates hand-cut, layered, fringed-piñata paper, three-dimensional sculptures that are inspired by old paintings and manuscripts. To me, Benavidez’s work literally looks like magical creatures brought to life. In terms of Mexican folk artists, I would recommend learning about artists Frida Kahlo and Diego Rivera, who were not only successful individually, but also married to each other (twice, in fact), and groundbreaking in different ways. Among other accolades, Kahlo was the first Latin American woman artist to have a painting in the Louvre. Rivera was a painter, muralist, and a political activist. The Flower Seller—a 1941 Rivera painting that features a flower seller kneeling before a massive bouquet of calla lilies is one of my favorite paintings. The Cazuela that the Farm Maiden Stirred, a Pura Belpré Honor recipient, is a companion book to The Piñata that the Farm Maiden Hung, and both are told in the cumulative style. In your opinion, what are the benefits or drawbacks of writing chain tales? Can we look forward to hearing more from the farm maiden? I loved writing these two cumulative, original folk tales, in part because of what I perceive as benefits for the reader—rhythm, repetition, suspense, and a swift conclusion. The stories are cadenced—a reader can almost sing each story if so desired. When my son was much younger, he would ask me to read The Cazuela that the Farm Maiden Stirred as quickly as possible so as to render it almost a tongue-twister and I feel that I was able to do that because of its rhythm and pace. I like employing repetition as I believe it helps a reader discover and remember new words, and for a new reader, repetition is good for confidence-building. In addition, repetition enables the reader to anticipate what will come next, i.e., the reader knows that each time the verse builds, another character will join the action, yet at the same time, the nature of the cumulative tale provides for suspense as the reader doesn’t yet know what will ultimately transpire. Finally, another benefit is the swift conclusion. Everything happens quickly, resulting in the characters finishing the piñata and finally, surprising the little girl. I don’t think there’s a drawback other than the fact that I created a type of “equation” with the first book—or, at least that’s how I’ve thought of it—like a math formula because I had a number of variables to add. Because I established that equation with The Cazuela that the Farm Maiden Stirred, I had to follow the identical approach—yet with a different story line, characters, and Spanish words in The Piñata that the Farm Maiden Hung. That was good because I knew the parameters within which I could write, yet at the same time, it was also limiting because in order to create a companion story, I had to be consistent. In each story, in addition to the overall storyline, I had to create characters and determine what each character would “bring” to the story in terms of items (or abilities, as in, for example, the sheep (oveja) braiding the rope (cuerda), and then finally, I wanted to make the story bilingual so that was another variable. I’d love it if I am lucky enough to think of an additional storyline for the farm maiden and her farm family, but at this point, I don’t know. Right now, I’m thoroughly enjoying seeing The Piñata that the Farm Maiden Hung in final form. It’s always a bit surreal to see the artwork that enhances and builds upon my text. I absolutely love how Sebastià Serra supplemented my original text by creating a visual narrative with wonderful illustration clues. His “clues” as I’m calling them, add a layer of meaning to the story. Specifically, the first page of the book shows the little girl, lying on her bed and smiling as she circles a date on her calendar (clue #1). Although there is no text, the reader can infer that that calendar date must be important. Thereafter, we see a double spread of illustrations with no text in which the farm maiden is waving goodbye (with the farmer, little boy, and farm animals looking on) to the little girl (clue #2). As the little girl waves back at the farm maiden, the little girl is walking away from the farm (clue #3) and importantly, carries an empty basket on her right arm (clue #4). We don’t see the little girl again until the last pages of the story—when the little girl is surprised by the piñata and birthday party that the farm maiden and her crew have created. On that page, readers may notice that Sebastià Serra cleverly added vegetables to the basket that the little girl is still carrying on her arm (final clue #5), allowing readers to infer that the farm maiden sent the little girl away on an errand (to the market) so that the farm maiden and the rest of the characters had time to create the piñata and prepare for the little girl’s birthday party surprise. I don’t think it’s possible to read this story without smiling. It’s very high-energy and full of music, crafts, food, friends, and family. There is, literally, a party building on the pages that captures the sense of excitement and anticipation that precedes birthdays and holidays, particularly for children. Is that a personal reflection of your own experiences? Thank you—that is so nice to read. Actually, I think it’s more of a reflection of a desire of mine to host a party like that with dear family and friends (and perhaps also a few crafty farm animals! ).